Commercial Rubber | Wolfe Flooring Inc.
Wolfe Flooring sells and installs a complete line of commercial and residential goods manufactured by the top brand names in the flooring industry. We'll make getting a flooring product easy. When you purchase products from Wolfe Flooring, you receive the added benefit of accessibility to technical knowledge, warranty care, routine maintenance and emergency service if calamities strikes for the life of the product. Please ask us about a FREE home or office presentation. We can both provide you with the products your looking for and install the choice of your dreams. Alternatively, we can provide the products without the installation service. Or, we can provide the installation service for the products you provide. The most economical choice for most customers is for us to both supply and install your flooring goods. Most often, this is also the path of least complications. We at Wolfe Flooring commit to following the installation procedures designated by the manufactures. If the product calls for a particular brand of pressure sensitive adhesive and a specific notch trial, then that is what will be used. The durability and cosmetic appeal of your new flooring product is determined by two factors: (1) the manufacturer's production of quality goods and (2) a careful and diligent installation. We can get you the quality goods and give you the quality installation. We plan to make you happy! Calculate the approximate square footage of each area by multiplying the length by the width. Add 10% for overage by mutiplying your total square feet by 1.10. For example, assume your room is 14 feet wide by 18 feet long. Rubber flooring is loosely divided between (1) rubber from virgin, raw, or unvulcanized rubber and (2) rubber from recycled, devulcanized rubber. Rubber flooring is manufactured from both natural rubber and from synthetic rubber. The natural rubber is formulated from the natural latex secretion collected from rubber trees. Whether natural latex or synthetic latex, the latex is greatly heated and mixed with additives to create durable rubber of particular shapes (e.g., tires, gaskets, etc.) called vulcanized rubber. Much of the homogeneous rubber flooring is manufactured from synthetic rubber. The virgin rubber flooring is capable of a wide array of through-body colors with very smooth texture and near imperious density. Virgin rubber flooring, whether in a roll or in a tile format, are commonly thinner, as a thickness or gauge of 0.08" (2 mm) to 1/8" (3.2 mm) thickness. The recycled rubber is of great help to the environment by the minimizing of waste. Once rubber has been vulcanized, the rubber does not quickly decompose. Old rubber, such as rubber tires, is repurposed. The old tires are purified of their metals, diced, and ground into small crumbs. 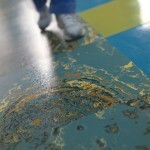 The reclaimed, ground rubber is reprocessed to mill rolls of composite rubber flooring. 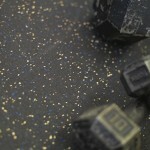 Recycled rubber flooring, also called chip-color rubber, speckled rubber, or fleck rubber, is available in black as standard. The addition of other colors increases the price. Recycled rubber flooring, whether in a roll or in a tile format, are commonly thicker, as a thickness or gauge of 1/4" (6.4 mm) to more than 1" (25.4 mm) thickness. Formats: The rubber is available in the form of rolls or tiles. 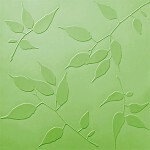 Some tiles are cut by the manufacturer with interlocking edges and are referred to as puzzle tiles. The benefit of the puzzle-tile format is that tiles are floating and can be replaced or reconfigured at a later date. 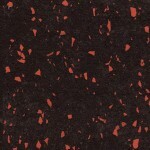 Colors: Colors are available as solid, speckled, marbleized, or oil-and-water effect. As explained above, the colors desired may influence if a virgin or recycled product is required. 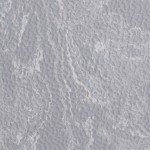 Texture: Appearance is further altered by a wide variety of surface textures: smooth, geometric, floral, hammered, diamond grid, brushed, linear, abstract, etc. Most of the varied textures are available as virgin rubber. These textured rubber floors are manufactured as slip-retardant flooring (SR or SRF) to reduce the chance of slips. cost-effective over the product's life cycle. Work Stations, Weight Rooms, Gymnasiums, Locker Rooms and more. 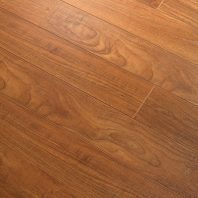 The following preparations should be made before your flooring product is installed. Some of these preparations may be unrealistic given your circumstances and may not have an affect on the success of the installation. However, we've included these manufacturer and regulatory agency recommendations in hope of the optimal installation and for disclosure reasons. Manufacturers may vary slightly. The manufacturer of the product you select is the final authority for their product. A layout should be agreed on. Seam placement can be adjusted to suit the customer's desire. Generally, seams should be positioned in low traffic areas without cross lighting. Doors may have to be adjusted or cut at the bottom (i.e., planed) after your flooring is installed. Determinations as to whether such alterations are needed may not be possible prior to the installation. Door adjustments are priced separately. This is highly unlikely for sheet rubber or rubber tile installations. If you have a wood subfloor, verify that a wood subfloor has at least 18" of air above the ground. The ground in the crawl space should be covered with a vapor barrier 4 mils (0.1 mm) thick or greater. If you have a concrete subfloor, the subfloor's pH level should be tested. (This test in not needed for wood subfloors.) As concrete cures, the hydrating moisture deposits alkali salt on the concrete's surface. The pH reading should be between 5 to 10 to be suitable for sheet rubber or rubber tile. Alkali can deteriorate adhesives. Testing of the subfloor should be done early in order to deal with any problem that you may possibly detect. This test is usually just a matter of formality, except in the case of new construction or below-grade subfloors. The porosity of the subfloor (wood, concrete, etc.) should be tested. This indicates how well the adhesive will bond with the subfloor. Testing of the subfloor should be done early in order to deal with any problem that you may possibly detect. This test is usually just a matter of formality. Customers will need to verify that the relative humidity of the building is between 30% to 70%. High humidity may cause your new rubber to expand and may also hinder the adhesive's curing time. Most customers have the proper relative humidity. Condition the room to between 65° and 100° F (suggested 75°) for 48 hours before the installation. The slab temperature should not be below 50° F on the day of installation. If you have a radiant-heated floor system, please set the floor to 70° for 24 hours before the installation. After the temperature has been properly set, acclimate the new sheet rubber or rubber tile to the room 48 hours prior to the installation. If the building is new construction, the building should be presented broom swept and free of all equipment, etc. The subfloor must be in suitable condition. Your subfloor may or may not require floor prep. The amount of preparation varies depending on: the type of subfloor, the subfloor's condition, the manufacturer's specifications, and the installation method you select. Subfloor preparation is priced separately. The stability and precision of the subfloor will have a bearing on the long-term success of your new flooring. Sheet rubber or rubber tile requires a very smooth floor. Sheet rubber or rubber tile will conform to minor irregularities and will eventually show by what is called telegraphing. Perimeter-glue installations require less floor prep than full-spread installations. BE ASSURED THAT FLOOR PREP IS USUALLY ONLY A NOMINAL EXPENSE. Here are some of the common preparations made on the different floor types: concrete, terrazzo, wood, or metal. Plywood joints should be level within 1/32". Reinforce subfloor to stiffen and smooth the surface with backerboard, Wonderboard®, wood underlayment, lauan plywood panels (Type 1, exterior, OVL grade, solid core mahogany), or plywood. Mopping with a mix of muriatic acid with water (1:10) or a mix of white vinegar with water (1:1) and rinse to neutralize alkalinity on concrete. Grind away concrete curing agents, parting agents, or surface hardeners. 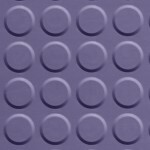 Fill embossed floors with an embossing leveling compound. Remove paint, varnish, wax, pigmented material, solvents, grease, oil, etc. completely. Sand away rust of metal substrates. The following is general advice. The instructions from the manufacturer of your particular product should prevail. There is more than one type of rubber, and rubber is available in both a piece format (e.g., puzzle flooring) and a sheet format. Therefore, some of the instructions might not pertain to your purchase. Documentation. Process the billing and get a hand written or published warranty. Retain the sales receipt and any product description from the purchase of the goods. If possible, document the manufacturer's name and the manufacturer's full product description including color. Furthermore, retain a sample of the sheet rubber or rubber tile for comparisons. For insurance purposes, it's good to have a picture of your new product in a safe place. Attic Stock. Retain extra rubber for possible repairs that may be needed in the future. Keep the materials in a dry place that stays about room temperature. Do not put this in a hot attic. Extreme heat can damage the rubber and cause discoloration. If in a sheet format, do not allow the rubber to be crushed while rolled. Roll the rubber onto an even roll or lay it flat. If your rubber was in a sheet format, it is especially good if you can roll the remnant around a core for support. Wolfe Flooring picks up all flooring product scraps. The customer may need to sweep the rubber. 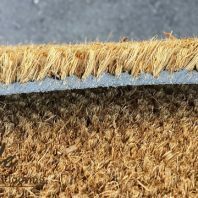 If adhesive was used on your seams, then seams should not be swept for 24 hours after the installation. If adhesive was used, do not return the furniture or expose the sheet rubber to heavy foot traffic for 24 hours after the installation. The adhesive needs time to cure. If adhesive was used on your seams, then do not step directly on seams for 24 hours after the rubber installation. Maintain the same temperature for 48 hours after your installation. Never allow the subfloor's temperature to fall below 55° or exceed 90° F during the life of your sheet rubber or rubber tile. If you have a radiant-heated floor system, please leave the floor set to 70° for 48 hours after the installation. Do not wet clean the sheet rubber or rubber tile for 3 days after the installation. Moisture may affect the adhesive (if used) and could lead to significant long-term problems. 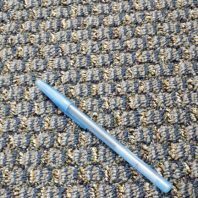 Shaw Philadelphia Commercial Carpet News Flash 54421 - Blue - LOCAL PICKUP ONLY!